Replacement pump used on some Whirlpool, Admiral, Amana, Crosley, Estate, Inglis, Kenmore, KitchenAid, Magic Chef and Roper brand washing machine models. 3363394, AP2907492, 3296, 3348014, 3348015, 3348215, 3352492, 62516, 63347, 64076, 8235, AH342434, EA342434, PS342434. To drain out water for direct drive washer machines. 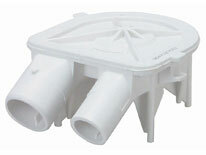 Drain pump for direct-drive washer. One large port, one small port. For used on models manufactured since 1982. Ports approx. 1-3/4″ and 1-1/4″ in diameter.